I finally bit the bullet and purchased a pen display tablet. There was a decent price on Newegg for the GT-191 Kamvas by Huion, significantly lower than what they were selling it for on Amazon. I wanted a tablet for a long time, and this was on my wish list. A few days later, this arrived at my office. No fancy unboxing pics and videos for me, sorry. I’ve never used one of these professionally. 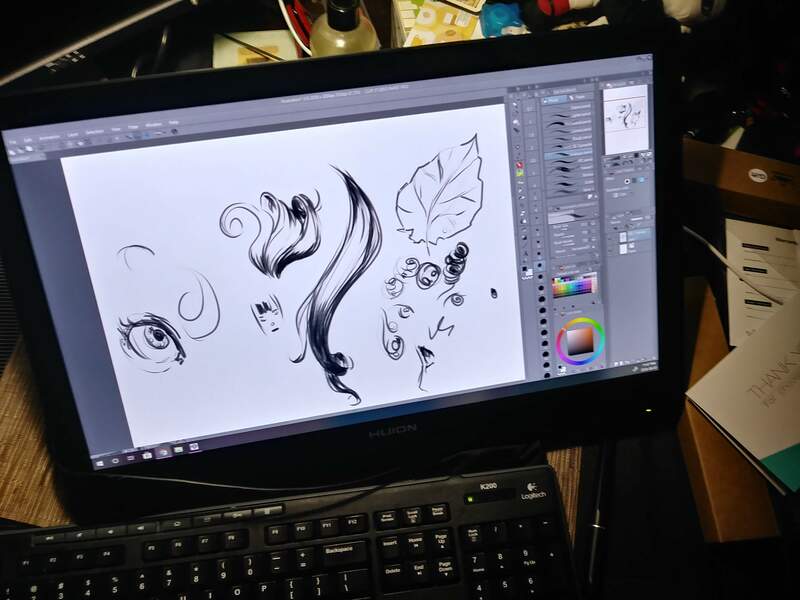 I had an Intuos at work, or at the office, I’ve been using my Bamboo Connect. The Bamboo was fine, however because of the small surface, I had a small amount of motion range when drawing. As a person dealing with Carpal Tunnel Syndrome, this only just aggravated my problems. The pen display is 19.5″, 1920×1080 resolution, IPS monitor, so right there solves some of my problem. I can open up my wrist motions a little more. Being able to draw directly on a surface, the same way as with pen to paper, is also something I’m now able to do now. I was spoiled to that sort of input from Inktober. Setting it up was easy. Video reviews warned me about the cord pinching in the back, but if you line up the cords so they run out from the side, it’s a bit better. Unfortunately, the drivers don’t seem to want to recognize more than one monitor. I’m not sure why that is, but that isn’t a big deal, to be honest. I don’t plan on having the Huion on all the time anyway. I admit, drawing feels different than I expected it to be. I did tweak the pen sensitivity levels to my own liking, but I guess it’s something I need to get used to. I managed to screw up applying the screen protector, so it’s a bubbly, dusty mess right now, but I left it on anyway because I very much prefer the papery feel of it than the smooth glass. Also, I’m paranoid of dropping stuff on it and scratching or cracking it. Will this help me improve? I’ve finished a drawing already and looking forward to doing more! I’m excited! 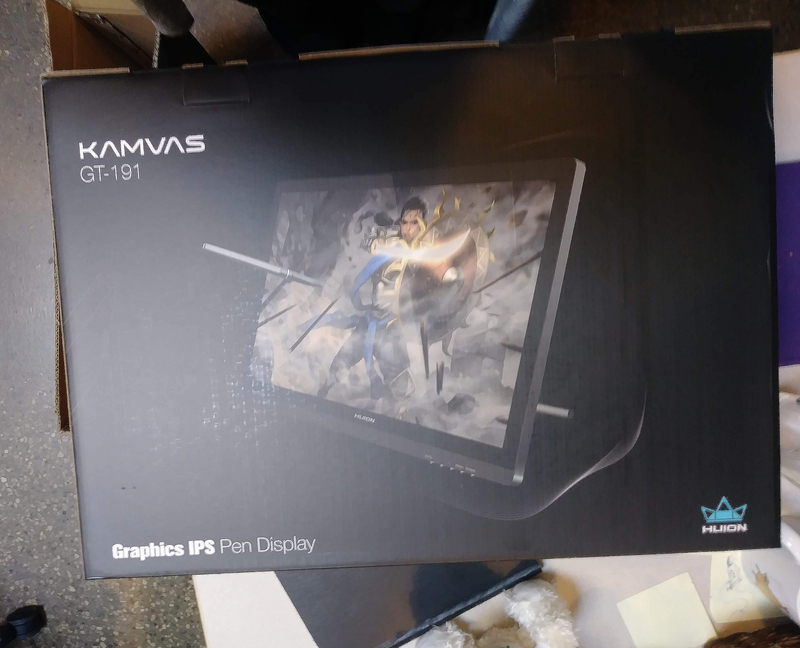 It isn’t hard to find a review for the Huion Kamvas GT-191, and most of them are generally positive. For me, it was mostly the price point . At less than $500 CAD, it was easy to dive into this than save up for a Wacom Cintiq, even though the latter is the industry standard. The video review below is from JelArts on Youtube. If you’re in the market for a quality pen display, take a look, and if you have one already, let me know if you have any tips for me!